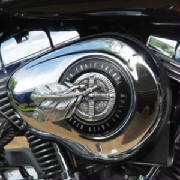 Native Spirit air cleaner cover insert for Dyna® models in Marine Grade aluminum polished to a mirror finish with black accents. Stainless steel allen head bolt and chrome cap included. Air cleaner cover not included. 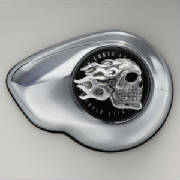 Flaming Skull air cleaner cover insert for Dyna® models in Marine Grade aluminum polished to a mirror finish. Stainless steel allen head bolt and chrome cap included. Air cleaner cover not included. 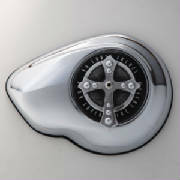 Spanish Cross air cleaner cover insert for Dyna® models in Marine Grade aluminum polished to a mirror finish. Stainless steel allen head bolt and chrome cap included. Air cleaner cover and decal trim ring not included. 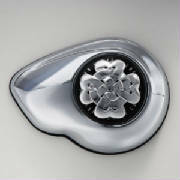 Celtic Knot air cleaner cover insert for Dyna® models in Marine Grade aluminum polished to a mirror finish. Stainless steel allen head bolt and chrome cap included. Air cleaner cover not included. 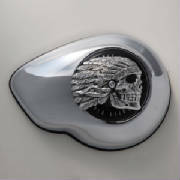 Native American Medicine Wheel air cleaner cover insert for Dyna® models in Marine Grade aluminum polished to a mirror finish. Stainless steel allen head bolt and chrome cap included. Air cleaner cover not included. 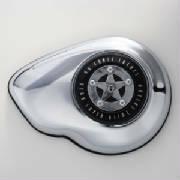 Star air cleaner cover insert for Dyna® models in Marine Grade aluminum polished to a mirror finish. Stainless steel allen head bolt and chrome cap included. Air cleaner cover not included.